This is Southwestern America style cooking. 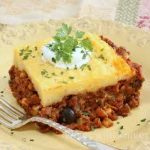 This Tamale pie is not a tamale and not a pie, it's just a lot easier than making real tamales! It's adapted to satisfying the American palate. Preheat oven to 400 degrees. Heat oil in a large ovenproof saute pan over medium-high heat. Add onion, carrots and garlic and season with salt. Cook, stirring occasionally, until onion is translucent, about 5 minutes. Add chili powder and tomato paste; cook, stirring, 30 seconds. Stir in beef and cook, breaking up with the back of a spoon, until no longer red, about 5 minutes. Add tomatoes with their juices and beans, bring to a boil and cook 2 minutes. Remove from heat. Whisk together flour, cornmeal, sugar, salt and baking powder in a large bowl. Whisk in buttermilk, eggs and butter. Spoon mixture over top of filling, spreading almost to edges of pan. Transfer to oven and bake until a toothpick inserted in topping comes out clean, about 20 minutes. Let rest 20 minutes before serving.